As part of the WINGSPAN renovations, seven artists were chosen to create new artwork for the airport. 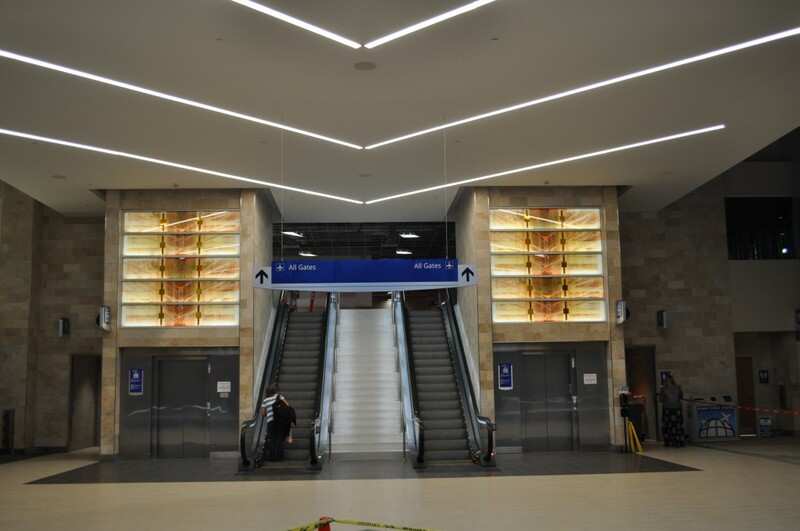 From canvas to glass design, GSP is thrilled to be featuring local inspired art in the newly renovated airport. Among other talented local artists, Arthur Stern’s work is the second of seven pieces to be installed recently. Stern specializes in architectural glass and stained glass designs. He draws inspiration from traditional American glass artists, combining such influences into unique designs that are strongly inspired by architecture. Stern considers himself to be a designer first and an artist second, creating pieces that are sensitive to the surrounding environment. “My work is a continuous process of exploring and refining a personal abstract language that I can apply to the specific criteria of an architectural project. I look forward to opportunities where good architecture and interior design are made better through the creative use of glass,” said Stern. Stern’s work was installed on July 18, with the help of Binswanger Glass. A longtime friend and fellow artist, Blake Praytor was also on hand helping Stern oversee the installation. Praytor has photographed Stern’s installations throughout the years, and is excited to finally have Stern in his hometown, making this installation special for both artists. Complementing the newly renovated ticket lobby, Stern’s glass panel designs are displayed above both sets of elevators. He also creates free standing sculptures, mixed media works on canvas and board, as well as works on paper. To learn about Arthur Stern and his work, check out his website! This blog is The Terminal's opportunity to share its knowledge about the WINGSPAN project, air travel and the story of Greenville-Spartanburg International Airport - past, present and future. Coming soon: Another touch of the Upstate at GSP!